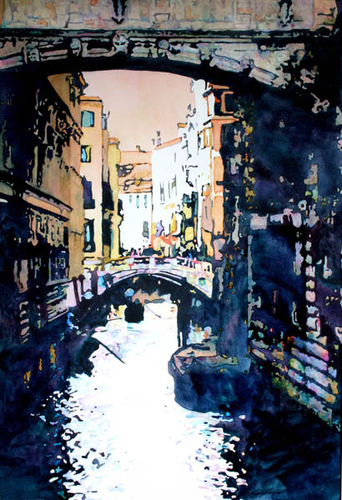 Watercolor Painting of the Bridge of Sighs, Venice, 28x19 (image size). This is a scene that has been an artist subject matter for centuries. The Bridge of Sighs took prisoners from the Venetian court, across the canal to the dark dungeons. This rendition is very unusual. It concentrates on dark, cool shapes in the foreground which frames warm, peach, yellow and orange background. Surrounding intense watercolors with transparent darks makes the colors sing. The silhouettes of gondolas, gondoliers and boats on the canal are also visible. This painting was featured in North Light Books, Splash 12, 2011 and earned a Award of Merit in Virginia Watercolor Society, Annual Juried Exhibition in 2011. Full size giclee print is also available. The stated here is image size. The price of the original painting includes archival off-white cotton rag mat, cotton rag foam core backing, ready to insert in the frame of your choice. The framing adds approximately 8" to the height and the width.